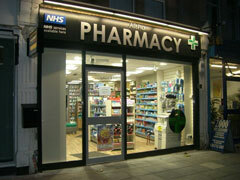 About: Local community Pharmacy - Professional friendly service . I’ve been using this pharmacy for 5 years. Nothing is too much and they have even responded to my emails out of hours. Please use your local pharmacy they are an invaluable resource. I've been using this pharmacy for about 15 years and have always found them helpful and efficient. Helpful and efficient, all you need in a Pharmacy, if you live locally KEEP IT LOCAL AND USE Raj and his team at Alisha Pharmacy.